Are you making any of these 6 common fitness mistakes? There are certain things which women tend to do while exercising and focusing on weight loss that could actually be having the opposite intended effects. These can be as simple as a daily routine or the daily exercises being completed. These small mistakes, if continued for long, can really take its toll on a person’s health and body. While cardio is a very common exercise among people trying for effective weight loss in a short amount of time, excess of anything is bad. Cardio breaks down tissue which in normal cases consists of fat. However, when excessively done, it starts breaking your muscles also, thus weakening your body. Here are indicators if you are doing too much cardio. Isolation exercises consist of exercising a single muscle or joint separately. They are used to strengthen a weak muscle or joint, but too much focus on it can lead to injury or weakening of the opposing joints or muscles. There is a common misconception about dieting that it means restriction of the food intake. However, this is not true. Dieting simply means taking in carefully planned and prescribed food. Less eating can lead to many issues such as fewer calories in the body than required, fatigue, unhealthy mind, muscle loss, and even depression. Don’t starve yourself. Eat healthily. The loads which do not challenge the human body can do more harm than good. It is important to gradually increase the load you lift and enhance your workout accordingly. Strengthen your body, burn fat and reap the rewards of lifting weights. Everyone is different and hence, their body needs different kinds of workout routines. It is impossible to spot reduce fat from certain areas of your body. The best example of this is the person doing crunches until she is blue in the face to get a flat, toned stomach. Unfortunately, it doesn't work that way. Instead, aim for high intensity or specific weight training routines to burn the fat which will then lead to the flat, toned look. While sudden weight loss at the start of the routine is normal, but if you are also feeling some of the symptoms of low blood pressure, sore throat, fatigue, increase in stress, nausea or depression, it is preferable that you take a step back and reevaluate your routine because the routine you are following just might not be working for you. For weight loss, women tend to search for a perfect plan and work it through. However, if they are not right for your body structure, these plans can work against you. Also, these plans need to be changed with increasing time to prevent muscle damages. Some common mistakes can put all your efforts in vain. It is important to focus on details and avoid things that are keeping you from losing weight. Along with this, you can also adopt a few of my favourite ways to burn belly fat for effective weight loss. 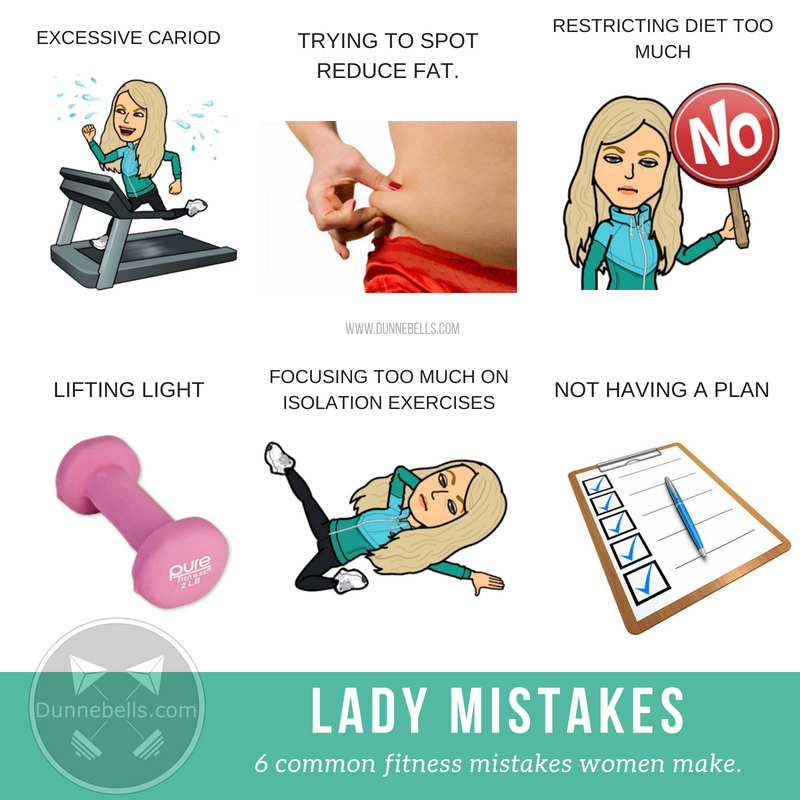 Have you made any of these common fitness mistakes? Share with us on twitter @dunnebells or Instagram @dunnebells_ and let us know your feedback.